Grassroots campaigners are currently explaining to European officials and elected representatives how a hard border will devastate communities and the local economy from Derry to Dundalk. Lobbyists, who have been involved in recent ‘go slow’ protests along the border, including at Bridgend, are taking part in a two day delegation to Brussels, which has been organised by Sinn Féin MEP Martina Anderson. Declan Fearon, from Border Communities Against Brexit, is among nine delegates taking part. 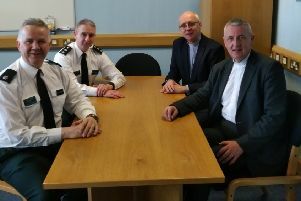 He says the mission is determined to impress upon the decision makers in the European Commission and the European Parliament that they “will not tolerate a hard border on the island of Ireland”. “The prospect of a new EU frontier, stretching from Dundalk to Derry, some 300 miles, is not acceptable to those of us living and working in border areas, North of South,” he said. “We are being taken out of the European Union against our will, 56 per cent of the North’s population voted to Remain. “Europe has had a tremendous positive impact on the North’s economy and social cohesion for decades, 60 per cent of our exports are sent to Europe (two thirds of this to the South), while 72 per cent of our imports come from Europe,” he added. The prospect of a new hard border in the wake of Brexit has already prompted consternation and concern in Derry, Donegal, and all the way to Carlingford Lough, from a broad cross-section of civil society. There have been ‘Go Slow’ protests; Derry Chamber of Commerce Chief Executive Sinead McLaughlin and Derry City and Strabane District Council funding manager Richard Osterhus have warned any hardening of the border post-Brexit will only damage the local economy; and Manufacturing NI, Chief Executive, Stephen Kelly, has warned local exporters will face an additional £478 charge per cargo shipment to the EU post-Brexit. The Director of the Centre for Cross Border Studies, Ruth Taillon, has warned groups such as Co-operation and Working Together (CAWT) will have the funding rug pulled in the event of Brexit; ex-diplomat Dr. Ray Bassett, recently suggested a ‘hard Brexit’ would seriously undermine the Good Friday peace accord and feed political disaffection in Derry; and Declan Billington, Chair of the Northern Ireland Food and Drink Association (NIFDA), said 30 per cent of a £4.6billion food and drink industry in the North would be subject to international trade deals after Brexit. Now the potentially damaging impact of Brexit on local businesses and communities is being underlined at the Berlaymont and in the European Parliament. Mr. Fearon said: “North-South trade amounted to more than six billion euros in 2014 and 1.85m cars; 177,000 lorries and 208,000 light vans cross the border each month. “Another huge problem is the massive loss of European farm supports, which from 2014 to 2020 is 3.2billion euros to farmers and rural communities in the North. He said people living along the border feared Brexit would lead to communities being partitioned once again. “A hard border will divide farms, parishes, villages and neighbours with strong family ties on either side of the Border; it will disrupt every day life whether to go to work or to shop or to engage in sporting fixtures; it will seriously disrupt business, create an economic shock for Ireland and especially the Border Corridor. “Our objective is to inform European decision makers that Ireland cannot be separated by two trading regimes, the imposition of customs checks, immigration control on county boundaries, all of which will lead to economic devastation resulting in many job losses. “The North of Ireland must be allowed to Remain, to trade freely, to move our goods and services and our people across the island of Ireland,” said Mr. Fearon.